MSP airport is handing out SuperBowl buttons and free hand warmers for travelers. The Minneapolis-St. Paul International Airport is ready for the arrival of tens of thousands of Super Bowl 52 fans — and extremely prepared for their departure from the Twin Cities on Monday after Sunday’s big game. "For many Super Bowl attendees, Minneapolis-St. Paul International Airport will be their first and last impression of Minnesota, and we want to ensure it’s a great one," said Brian Ryks, executive director and CEO of the Metropolitan Airports Commission, which owns and operates MSP. The airport has spruced up with a special Super Bowl info page on its website, an enhanced Wi-Fi system, new carpeting, new furniture, new shops and restaurants and has added lots of NFL signage and pop-up Super Bowl souvenir shops in the terminals. Extra volunteers have been recruited to help travelers with airport wayfinding and extra space has been arranged for all the taxis, rental cars, limos and Uber and Lyft cars that will be supplementing public transportation options at the airport. Weather contingency plans are in place. Airport police and fire crews have been working with city, county and federal law enforcement agencies on how to deal with various scenarios. And the Transportation Security Administration is bringing in extra officers and passenger-screening canines to help process passengers heading home after the game. "TSA operations at MSP following the Super Bowl will be an 'all hands on deck' operation," said TSA spokeswoman Lorie Dankers. "From uniformed staff to plain-clothes administrative personnel, everyone will be working." TSA and MSP expect to set passenger records on the Monday and Tuesday after Super Bowl, but airport officials are confident their team is up for the challenge. "We have a solid plan in place to keep everyone safe, the operation running smoothly, and travelers’ experience positive," said MSP’s Ryks. Safe and smooth is good, but MSP’s Super Bowl welcome team is also offering fans of the Philadelphia Eagles and the New England Patriots some fun extras. A 10-day "Performing Arts Spectacular" is underway, with a lineup of events featuring everything from Bollywood, hip-hop and flamenco dancers to vocal and drum performances. The airport’s animal ambassadors will be out in full force. 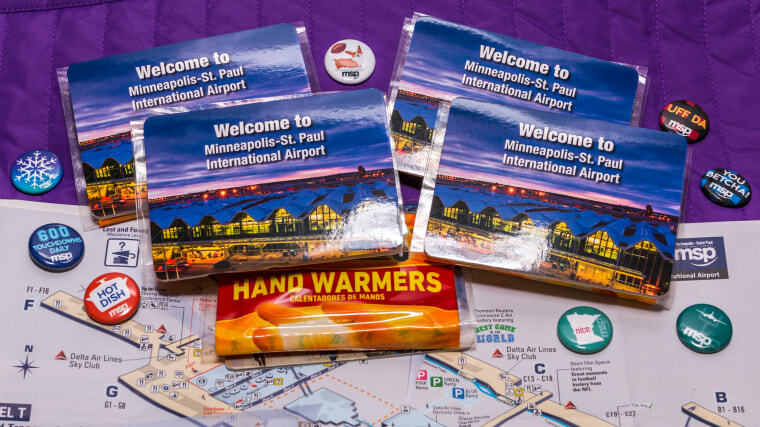 And giveaways in the terminals will include a series of Super Bowl/Winter-themed MSP buttons and foldable terminal maps with disposable hand warmers attached. Several airlines, including Delta, Southwest, American and United, have added flights to MSP from Boston, Philadelphia and many other major hubs for Super Bowl ticket holders and last-minute planners heading to the Twin Cities to partake of Super Bowl festivities. In addition to the extra flights, American Airlines, the official airline for the Philadelphia Eagles, is handing out Eagles rally towels to all passengers flying on from Philadelphia to Minneapolis-St. Paul through Sunday, Feb. 4. And on Saturday and Sunday, United Airlines is serving “football favorites,” including hot dogs and macaroni salad, to customers visiting the carriers’ lounges in its hub cities. United Club visitors in Boston, Philadelphia and Minneapolis will also find extra treats, including lobster roll and New England clam chowder in Boston; Tastykakes and a build-your-own hoagie bar in Philadelphia; and Captain Ken’s Wagon Trail Chili (a Minnesota favorite) in Minneapolis.